What image does Barbie bring to your mind? How about a young woman outfitted in a climbing helmet and harness and wearing rugged boots instead of high heels? I heard about just such a Barbie on The Promised Land, a new program on my public radio station. In an hour-long interview with Nalini Nadkarni, Ph.D., a professor of environmental sciences at The Evergreen State University in Olympia, Washington, I learned about forest ecology, Nadkarni’s innovative outreach programs, and a TreeTop Barbie doll that can, in a young child’s imagination, ascend into the cloud canopy of a tropical rain forest just as Nadkarni has. I quite liked that image. Three decades ago, as a young graduate student, Nadkarni climbed into the treetops of Costa Rica’s Monteverde National Park, and became one of the first scientists to explore the unique ecosystems of the forest canopy. Over the years, she’s published extensively in scientific journals. But ten years ago, while doing research in Monteverde, she heard chainsaws. Developers were clear-cutting trees just outside the park boundary. 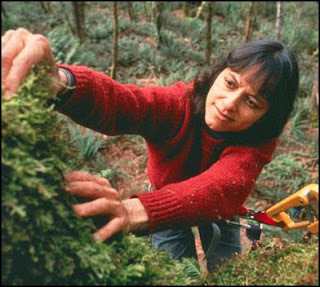 Those buzzing saws convinced her to try to reach the widest possible audiences about the importance of forest ecosystems. She began by talking to those developers. Since then, she’s expanded to prison inmates, religious communities, and, yes, young girls and boys. Nadkarni pitched the idea of a field-research Barbie doll to Mattel, and even included a pamphlet on forest ecology, but received no reply. So she and her assistants bought their own dolls from thrift stores and worked with a tailor to fashion a realistic outfit. Their first efforts sold through word of mouth. By 2003, when The New York Times called TreeTop Barbie “science’s blondest and most curvaceous attempt yet to reach the public,” Nadkarni had fashioned more than 300 of the dolls. At that point, Mattel responded to the professor — to tell her to stop making the dolls. The International Canopy Network (ICAN) has taken over the TreeTop Barbie project and offers the dolls for a donation of $55. The organization’s website gives plenty of details about the doll’s clothes, in time-honored Barbie fashion: “Barbie’s field clothes are hand-sewn and include rough-and-tumble climbing pants, field vest, field shirt, helmet, boots, and all the appropriate climbing gear...” TreeTop Barbie also comes with binoculars, a write-in-the-rain data book, and doll- and human-sized field guides of tree-canopy flora and fauna. Nadkarni understands the importance of making environmental science cool to kids. She also understands the importance of cool role models. Dubbed “the queen of the forest canopy,” she strikes me as a pretty cool role model herself. 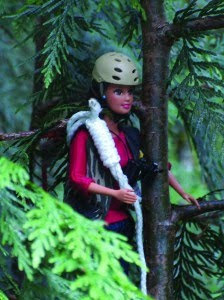 - Learn about the International Canopy Network and TreeTop Barbie. 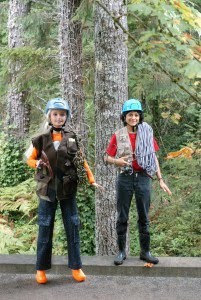 - Read an "interview" with TreeTop Barbie, channeled through Nalini Nadkarni. - Watch Nadkarni climb a giant fig in Monteverde, Costa Rica, and take a video tour of that forest canopy.